Size - ml/oz: 750 . Treatment Shampoo For Dry Coloured Hair. The hair is one of the most noticeable features of our outward appearance and demands constant care. In addition the sun, wind, dryness, over-usage of hair styling devices, chemicals used during colouring, exposure to salt water and hard water, tension and imbalance damage hair quality and hair appearance becomes thinner, dry, brittle and split. For all of these conditions, one of the highest quality shampoos in existence was created. 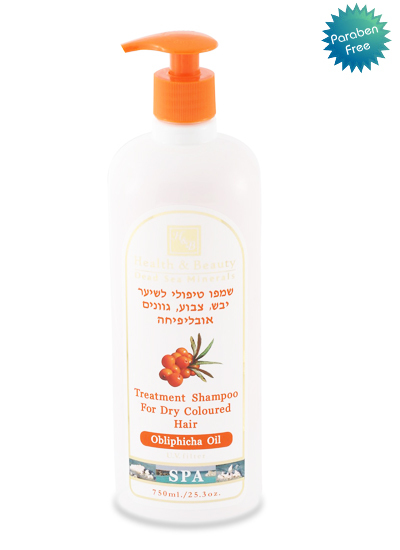 The shampoo contains extracts of sea buckthorn oil, which originates in Russia and possesses many known special properties. Proteins that rehabilitate hair's appearance, rich in aromatic oils, vitamin E, pro-vitamin B5, sun radiation filters, and a complex of Dead Sea minerals for repair, strengthening and rebuilding of the hair and the prevention of colour fading. This special combination contains ingredients such as jojoba oil, sea buckthorn oil extract, carrot oil, grape seed oil, almond oil, olive oil, argan nut oil, honey and palm oil, penetrating the scalp, nourishing, repairing and enveloping the hair with a layer of natural protection for healthy hair appearance, soft, flexible and with a wonderful scent. Recommended for dry or coloured hair and for hair with a tendency for thinning. Suitable for the whole family for daily use. Directions for use: shampoo while massaging into the scalp, rinse and repeat a second time, leave the shampoo in the hair about two minutes and rinse thoroughly. To complete the treatment, it is recommended to use one of H&B's hair masks.